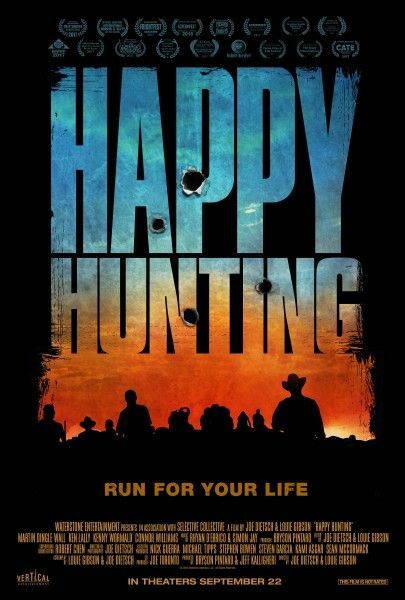 Happy Hunting follows Warren, a degenerate drifter, suffering from debilitating alcohol withdrawals on a daily basis. On his way down to Mexico, he becomes stranded in Bedford Flats, a one-horse town nestled deep in the American desert. It was a once-prosperous hunting community that has been reduced to an impoverished dust bowl. Unfortunately for Warren, it turns out that the town’s pastime is rounding up drifters and hunting them as part of an elaborate sporting event. To make matters worse, he’ll go into alcoholic withdrawal unless he finds a way to stay loaded. It all builds to a blood-soaked, live-or-die showdown deep in the desert. Read more on Wikipedia.